As part of the Township's ongoing Road Maintenance Program, work is scheduled next week on Howard Road in the Kingston neighborhood, and Oakley Court in Wexford. Weather-permitting, the Township's contractor will be repaving Howard Road on Monday, July 29. Concrete work is expected to begin on Oakley Court on Monday, as well. Concrete repairs were completed on Dell Drive this week. For more information on these projects, the Road Maintenance Program, or any road project, please contact the Engineering Department at (856) 424-3203. The New Jersey Department of Transportation has cancelled overnight construction along Brace Road for tonight (Friday, July 26). Work will resume from 9 p.m. to 6 a.m. on Monday, July 29. During work hours, Brace Road is closed from Route 561 to the Kings Highway intersection, and drivers should seek alternate routes to their destintions. Come to the historic Barclay Farmstead this Tuesday, July 30, to see what hundreds of Cherry Hill residents have already experienced: Music Under the Stars! 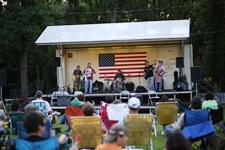 This free summer concert series, sponsored by Concentra, Sun National Bank and Metro PCS, is a chance to enjoy live entertainment on the grounds of a historic 19th-century Quaker farmstead. Don’t miss the program’s last concert on Tuesday. This week’s headliner, the Kenny Jeremiah Trio, will perform a “Birth of Rock” concert featuring the music of Elvis, Jerry Lee Lewis, Chuck Berry, Little Richard and Buddy Holly. Opening act Haley Rossell will kick things off at 6:30 p.m. Bring a chair, a blanket, and even a picnic dinner - just don't forget your appetite for great music! Special thanks to Short Hills Deli for providing healthy snacks, and B101 for their continued support. Shows are cancelled in the event of rain. For more information, click here or contact the Recreation Department at (856) 488-7868 or Events@chtownship.com. The Cherry Hill Recreation Department launched a new Facebook page this week, where residents will find photo galleries and upcoming events, activities and classes throughout Cherry Hill. Click here to be directed to the page. Be sure to "like" it and recommend to all your friends! Join Council President David Fleisher and Councilwoman Susan Shin Angulo for the 54th annual Cherry Bowl this Saturday, July 27 at Wexford Leas Swim Club. The event kicks off with an opening ceremony and parade starting at 8:20 a.m., and the swim meet begins at 9. Admission is $5 and seating may be limited, so bring a chair. In the event of rain, the Cherry Bowl will be moved to Sunday, July 28. The swim meet draws more than 700 swimmers from 13 Cherry Hill swim clubs for a day of friendly competition each year. Visit the Cherry Bowl website for more information. The Cherry Hill Glee Show Choir will perform this Wednesday, July 31 and Thursday, Aug. 1 at Cherry Hill High School East. Doors open at 6:30 p.m. and the performance starts at 7. Tickets are $10. The choir members are singers from 4th through 10th grade who participated in a five-week program this summer to develop musical skills, singing and audition techniques, stage presence and confidence as performers. For more information, contact the Recreation Department at (856) 488-7868 or Events@chtownship.com. The Camden County Mosquito Commission is spraying for mosquitoes throughout the summer in Cherry Hill. This week, the commission sprayed in Erlton South, Barlow, Lucerne, Bunker Hill, Barclay Farms South, Woodcrest, the Hunt Tract and Kings Croft. The spray is not harmful to humans and pets, but those who are sensitive to irritants or have respiratory concerns should avoid direct contact. The Commission sprays in neighborhoods and open spaces, but will not spray on private property. Residents can curb the growth of mosquito populations by checking their properties for sources of standing water, such as swimming pools, trash can lids and other containers. Click here for more information on the sprayings and mosquito prevention. For further information or to report a problem, contact the Mosquito Commission at (856) 566-2945 or skeeters@camdencounty.com. Come to the historic Barclay Farmstead this Tuesday, July 30, to see what hundreds of Cherry Hill residents have already experienced: Music Under the Stars! 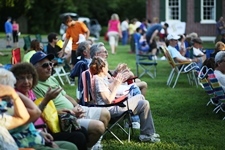 This free summer concert series, sponsored by Concentra, Sun National Bank and Metro PCS, is a chance to enjoy live entertainment on the grounds of a historic 19th-century Quaker farmstead. Don’t miss the program’s last concert on Tuesday. This week’s headliner, the Kenny Jeremiah Trio, will perform a “Birth of Rock” concert featuring the music of Elvis, Jerry Lee Lewis, Chuck Berry, Little Richard and Buddy Holly. Opening act Haley Rossell will kick things off at 6:30 p.m. Bring a chair, a blanket, and even a picnic dinner - just don't forget your appetite for great music! Special thanks to Short Hills Deli for providing healthy snacks, and B101 for their continued support. Shows are cancelled in the event of rain. For more information, click here [http://www.cherryhill-nj.com/DocumentCenter/View/1607] or contact the Recreation Department at (856) 488-7868 or Events@chtownship.com [mailto:Events@chtownship.com] . The Cherry Hill Recreation Department launched a new Facebook page this week, where residents will find photo galleries and upcoming events, activities and classes throughout Cherry Hill. Click here [https://www.facebook.com/#!/pages/Cherry-Hill-Recreation-Department/153392904854925] to be directed to the page. Be sure to "like" it and recommend to all your friends! Join Council President David Fleisher and Councilwoman Susan Shin Angulo for the 54th annual Cherry Bowl this Saturday, July 27 at Wexford Leas Swim Club. The event kicks off with an opening ceremony and parade starting at 8:20 a.m., and the swim meet begins at 9. Admission is $5 and seating may be limited, so bring a chair. In the event of rain, the Cherry Bowl will be moved to Sunday, July 28. The swim meet draws more than 700 swimmers from 13 Cherry Hill swim clubs for a day of friendly competition each year. Visit the Cherry Bowl website [http://www.cherrybowl2013.com/] for more information. The Cherry Hill Glee Show Choir will perform this Wednesday, July 31 and Thursday, Aug. 1 at Cherry Hill High School East. Doors open at 6:30 p.m. and the performance starts at 7. Tickets are $10. The choir members are singers from 4th through 10th grade who participated in a five-week program this summer to develop musical skills, singing and audition techniques, stage presence and confidence as performers. For more information, contact the Recreation Department at (856) 488-7868 or Events@chtownship.com [mailto:Events@chtownship.com] . The Camden County Mosquito Commission is spraying for mosquitoes throughout the summer in Cherry Hill. This week, the commission sprayed in Erlton South, Barlow, Lucerne, Bunker Hill, Barclay Farms South, Woodcrest, the Hunt Tract and Kings Croft. The spray is not harmful to humans and pets, but those who are sensitive to irritants or have respiratory concerns should avoid direct contact. The Commission sprays in neighborhoods and open spaces, but will not spray on private property. Residents can curb the growth of mosquito populations by checking their properties for sources of standing water, such as swimming pools, trash can lids and other containers. Click here [http://www.cherryhill-nj.com/CivicAlerts.aspx?AID=371] for more information on the sprayings and mosquito prevention. For further information or to report a problem, contact the Mosquito Commission at (856) 566-2945 or skeeters@camdencounty.com [mailto:skeeters@camdencounty.com] .